FREQUENTLY ASKED QUESTIONS – STAR COACHES, INC.
Q: HOW MUCH DOES IT COST TO RENT A "SLEEPER COACH"? A: Well, that's a lot like calling Delta Airlines and asking them "how much does it cost to fly in a plane? Basically, this is financial compensation to a Driver for driving higher miles in any given day while remaining legal within the guidelines set forth by The Department of Transportation (10 hours on-duty driving). Star Coaches Drivers give back to our Clients by not charging for an Overdrive until 501 miles. This difference has saved our Clients thousands of dollars. 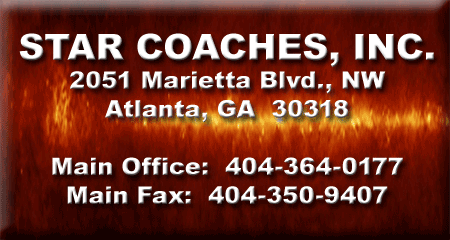 All Star Coaches Drivers are required to use ELD or Electronic Logs... The systems are installed in all of our coaches and monitor not only the physical location of our fleet, but also record and monitor the Driver's time on duty, when the coach is started and stopped, as well as a number of driving alerts. It should be noted that Star Coaches, and our Drivers, strictly comply with The Department of Transportation for both safety and legal reasons. The limit set forth by The Department of Transportation is 10 hours of "on-duty" driving per day. Q: WHAT INFO DO YOU NEED TO SEND ME A PROPOSAL? 2. Your Name, Email Address and Contact Numbers? 7. Number of Bunks Needed? 9. Is a Rental Trailer needed? 10. Is the coach going to need an exterior promotional wrap? You may also fill out our "request a proposal" form by simply clicking on the link in the right side bar of this page. I would also encourage you to experiment with our "Tour Cost Estimator" (see the link in the side bar to your right). This unique form gives you the opportunity to play with variables to determine how much bus you can afford for your next tour. No other coach company offers such a transparent and useful method of preparing tour budgets! Q: WHY IS YOUR PROPOSAL MORE EXPENSIVE THAN YOUR COMPETITORS? A: That's simple... My proposals are thorough and accurate... I do not leave anything out of my proposals... No stone is left unturned... I list every possible expense or cost that you will encounter on your tour... Many of my esteemed colleagues in the industry are simply not as thorough and detailed in their proposals... It is very easy to create a proposal that "looks good"... And I do not fault some of my colleagues for doing just that... The bottom line is this: At the end of the tour you will encounter the line item costs that I list in my proposals... And you will encounter the line item costs that are NOT listed in other proposals... Either way you will encounter these costs... Would you prefer knowing about them BEFORE going to contract, or after the tour is over? Q: OK, IF YOUR PROPOSAL IS SO GOOD, CAN I SEE A SAMPLE? Q: WHY WOULD YOU PUT A REAL SAMPLE PROPOSAL FOR ALL TO SEE? Q: I'VE HEARD ABOUT YOUR "TOUR COST ESTIMATOR"... WHAT IS THAT? Q: CAN WE USE OUR OWN DRIVER? Q: DO YOU HAVE RENTAL TRAILERS? Q: WHAT ARE THE SIZE AND WEIGHT LIMITS OF YOUR RENTAL TRAILERS? Q: WHAT HAPPENS IF WE HAVE A MECHANICAL BREAKDOWN?